Sea Turtle is located on Brighton Beach, at the south end of the Platinum Coast of Barbados, with direct access to the sand, and with uninterrupted views of the Caribbean Sea. Built in the 1960's this spacious 3 bedroom, 3 bathroom bungalow is set in a quarter of an acre of mature gardens and underwent a full refurbishment in November 2011 (including new soft and hard furnishings throughout). A 500 sq ft sun deck and a pool were added in November 2012. Situated in a quiet residential neighbourhood two miles north of the city center the house feels very private and is ideal for groups or families wanting a private hassle free beach experience or for intimate 'honeymooning' couples. The beach is over 1.2 miles long and it is the largest turtle hatchery on the island. Turtles are often seen laying eggs, hatching and swimming in the surrounding waters. Green monkeys visit the property and the garden is full of humming birds. Being set back over 100 yards from the main road, Sea Turtle does not experience the road noise suffered by most West Coast villas and as Brighton Beach is a mainly residential beach it is almost deserted for most of the day/week. The Master and second bedrooms are both 'en-suite'. The Master has a 'California King-size' bed and the second and third rooms can be configured as either 'Large Double', 'Twin' or three singles. The house is child friendly and there is a baby cot/crib available if required. In addition to kitchen, laundry and lobby, the living area comprises of an internal 18' x 28' lounge with giant TV, an external 30' x 12' covered dining area with seating for 8, and 15' x 30' canopied wooden sundeck with loungers and barbecue, leading onto a 30' x 15' sundeck with outdoor pool. There is also a porch to the roadside with seating, where you can catch the early morning sun. There is a daily maid/laundress to wash-up, do laundry, and to clean and service the rooms. 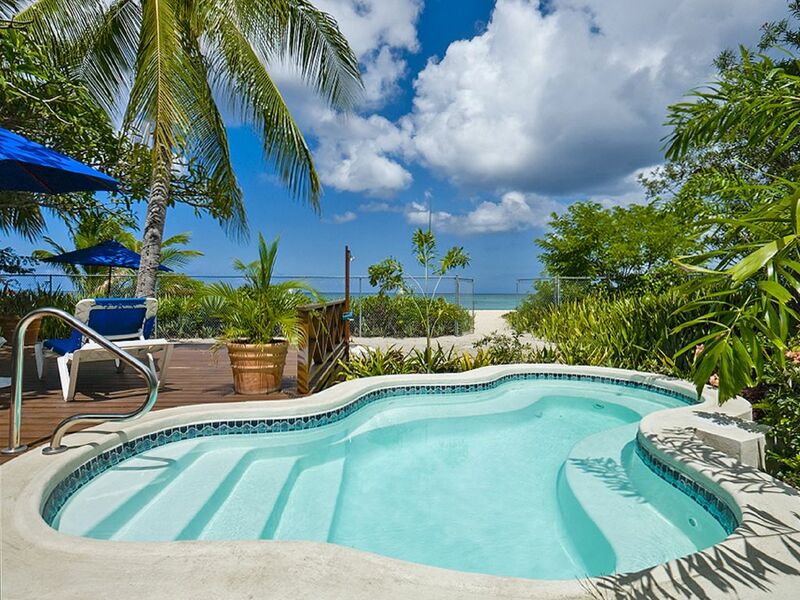 The house is a five minute drive south of the best restaurants on the island, 600m from a large modern supermarket, right on the beach and walking distance from Kensington Oval Cricket Ground. The Master bedroom and bedroom 2 both have en-suite bathrooms. There is also a third family bathroom, and outside there is an external shower. There are two kayaks available for use. Please ask the housekeeper for details. There is a pool inset into one side of the decking which overlooks the beach and sea. The kitchen features a fridge, dishwasher, double over, toaster oven and a micro-wave. It also has a breakfast table with seating for 6. The Laundry has a tub washing machine, sink and tumble drier. There is a lobby between the kitchen and main lounge with a sofa bed. The lounge has seating for 10, a wall mounted satellite TV, DVD and CD players. It is linked to the outside dining area by a 15ft sliding door and has sea views. The Dining Area is covered with a solid roof but is entirely open on the beach side and leads directly to the canopied sun-deck. It has a large glass dining table and seating for 8. The Sun-deck has two settees, two sun loungers and a barbeque. The decking is extended and has a pool set into one side of it and leads down to a sandy area for private sunbathing with sun loungers and umbrellas. There is a private gate which leads directly onto the beach. At the front there is parking for 6 vehicles and on the beach side are mature trees for shade. The property was better than the pictures. Great view, close to beach, swimming pool and great weather. Everything you could ask for. House was a little dated and could use renovating but the atmosphere off set that and actually not much time spent in the house except to sleep. Would recommend to anyone wanting a tropical vacation and would return. House precisely as described. Perfect organisation of security and housekeeping. Never used beach as much as this time, go for a swim or snorkeling maybe 10 times a day, truly a beach family vacation. Humming birds, geckos and even monkeys couple of times around the house gives nice tropical scenery. What to improve - Wifi signal on the decking area , it is too weak outside, need update, no one wants to sit inside while sharing nice pictures on instagram :) Regarding nearby restaurants, Cin Cin By The Sea is horrible, awoid, fish and chips in London is better than that, wasted £1400 for New Year dinner. But even bad restaurant experience couldn't spoil this holiday, we are happy: weather, beach, sand, sea, house, security, car rental, food shopping all perfect, one of the best holidays. Feel money well spent. Thank you. Our family stayed at Sea Turtle and enjoyed a beautiful family time! The housekeeper , Michelle, was an added bonus. The owner also employs a house manager, Susan. I did not have a positive experience with her, nothing terrible, just not positive. Being a high end property, we think the owners could make some improvements, a new refrigerator is tops on our list. They did replace the coffee maker very promptly when asked. The home is well situated, very safe and secure. Beachhouses are all about the beach and this one is quite perfect and you have the beach almost for yourself, just steps from the house. Two sets of deckchairs, one for the beach and one for the terrace, umbrellas for the beach, a big cooler if you can't make it back to the fridge, a state of the art BBQ - its all there. Michelle took good care of all the work in the house - we had a fantastic vacation. The pool looks much bigger in the pictures than it really is - its more like a big bathtub but with a beach like this you don't really need a pool for swimming. Sea Turtle is located on Brighton Beach, 2 miles north of Bridgetown (city centre and main fish market) and 3.5 miles south of Sandy Lane Hotel. Kensington Oval is walking distance and, being 4.5 miles from both Holetown and St Lawrence, the beach house is equidistant between both the major tourist/nightlife areas on the island. Some of the islands best bars and restaurants (CinCin, The Cliff, Daphne's & Scarlett's) are all less than a 5 minute drive north. There is a large modern supermarket only 600m away, and from there cheap local buses can be caught either up the West Coast or, via Bridgetown, to anywhere on the island. Sea Turtle is located on Brighton Beach, at the south end of the Platinum Coast of Barbados, with direct access onto the sand, and with uninterrupted views of the Caribbean Sea. Built in the 1960's this spacious 3 bedroom, 3 bathroom bungalow is set in a quarter of an acre of mature gardens and underwent a full refurbishment in November 2011 (including new soft and hard furnishings throughout). A 500sq ft sundeck and a pool were added in November 2012. Situated in a quiet residential neighbourhood two miles north of the city centre the house feels very private and is ideal for groups or families wanting an exclusive hassle free beach experience or for intimate 'honeymooning' couples. The Master and second bedrooms are both 'en-suite'. The Master has a 'California King-size' bed and the second and third rooms can be configured as either 'Large Double', 'Twin' or three singles. Although designed to sleep 6, there are beds for up to 10 guests should this be required (in exceptional circumstances). The house is child friendly and there is a baby cot/crib available if required. In addition to the kitchen, laundry, and the lobby, the living area comprises of an internal 18' x 28' lounge with giant TV, an external 30' x 12' covered dining area with seating for 8, and 15' x 30' canopied wooden sundeck with loungers and barbecue, leading onto a 30' x 15' sundeck with outdoor pool. There is also a porch to the roadside, with seating, where you can catch the early morning sun. There is a daily maid service which includes making up the rooms, all the cleaning, washing-up and all laundry. A cook can be arranged, at additional cost, if required. Longer Term Rates (14 nights +) All nights booked over 14 are charged at 50% of applicable daily rate Last Minute Specials Special one / two bedroom rates may be offered for short notice bookings - please enquire. Weddings The Property is available for intimate Weddings subject to negotiation and restrictions. Rates are subject to 7.5% VAT Credit card pre-authorization security deposit required.